In this area you are able to take a test or a quiz your instructor has added. To take or retake a test, in case your instructor has permitted it, visit the corresponding area within the course to locate it (i.e. Tests menu item). Click on the name of the test to enter its environment and carefully read the instructions. When you are ready, click Begin to start your test. While in the Take Test page, follow the instructions and answer the given questions. In case the test is timed, you will view a timer that counts down. 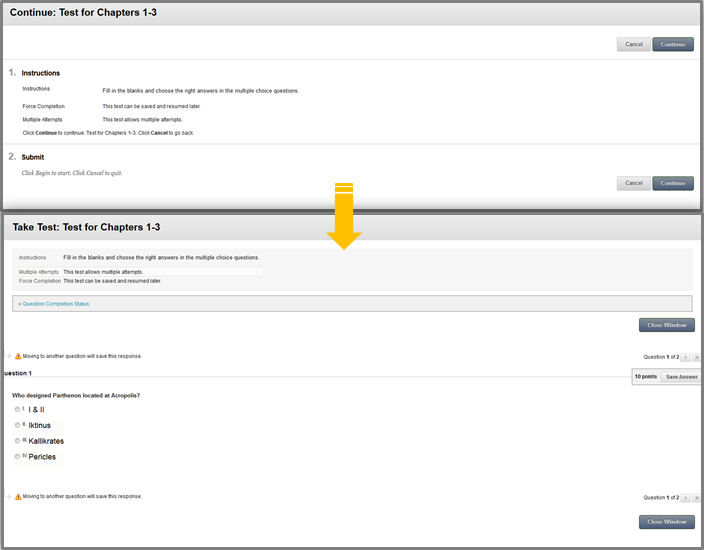 Blackboard Learn is able to save the individual answers you provided. When you finish, click Save and Submit. You will receive a confirmation pop-up message asking you if you are ready to submit the test. Click OK if you are ready. Then, follows a receipt page —Test Submitted— stating that the test is completed and submitted to the instructor. Click OK to review the detailed information relevant to the submitted test. Again, when you finish, click OK.
Once you submit a test it is possible to review the submission in case the instructor has released the results and if the test is graded or not. If the test is graded, you are able to view the results via the My Grades tool (visit the Tools menu item from within your course and click My Grades). Click the name of the test for detailed information. In case the test is available, access it by re-visiting the test from the area that it is located (i.e. Tests menu item). Again, click the title of the test and then click Begin to enter. Hit the View All Attempts to review it. Use hardwired connection.Please note that it is best to take tests from a stable connection and not from WiFi as you may experience connectivity issues and possibly lose all the test data due to a disconnection. Don’t open multiple Blackboard windows, as it may create problems in the submission of the test. Make sure you have performed all of the updates on your operating system and that your computer is malware and virus free. Close all other programs, running in your computer. Here you can take the available survey used for polling purposes and evaluations. Surveys are not graded. Click the link and follow the instructions. The process is the same with Test & Quizzes.